Though physically small, Singapore is an economic giant. It has been Southeast Asia's most modern city for over a century. 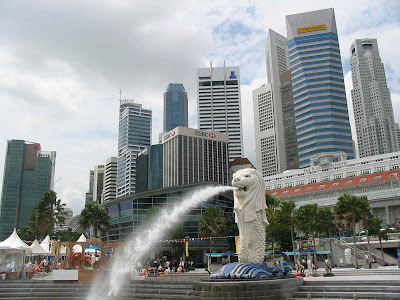 The capital city, also called Singapore, covers about a third of the area of the main island. The island republic's excellent infrastructure enables visitors to enjoy its many sites and attractions in a safe, clean and green environment. Award winning Changi Airport provides airlinks to major cities around the world. The train and subway systems are clean, fast and efficient. In addition, its state-of-the-art cruise terminal has established Singapore as one of the premier cruising centers of South East Asia and an exciting port of call on any Asian cruise itinerary. Located at the tip of the Malay Peninsula,Singapore is a clean, safe place to visit, its amenities are second to none and its public places are smoke-free and hygienic. Singapore is also a multicultural city, and close to one-quarter of its population are expatriates or foreign workers from all over the world. Known for its desire to become the technology hub of Asia, Singapore is the most wired country in the region. In the city, there is no need for a car. Public transportation is excellent and walking is a good way to explore the city . All major attractions are also accessible by tour bus. Since the city is only 60 miles (100k) from the equator, the tropical temperatures do not vary much. Rainfall is fairly evenly distributed through the year. No matter when you choose to visit, warm weather will be abundantly available. The visitor is struck immediately by Singapore's abundance of parks, nature reserves, and lush, tropical greenery.